The T-Stitch in Needlepoint: Small but Mighty! Here’s an easy way to quickly fill in small areas of a needlepoint design. The T-stitch is an open, airy needlepoint stitch that produces a dainty effect. It is used for backgrounds, like a lacy filling stitch for small motifs that are part of a much larger design, or in other areas where you would like the needlepoint canvas to show through. 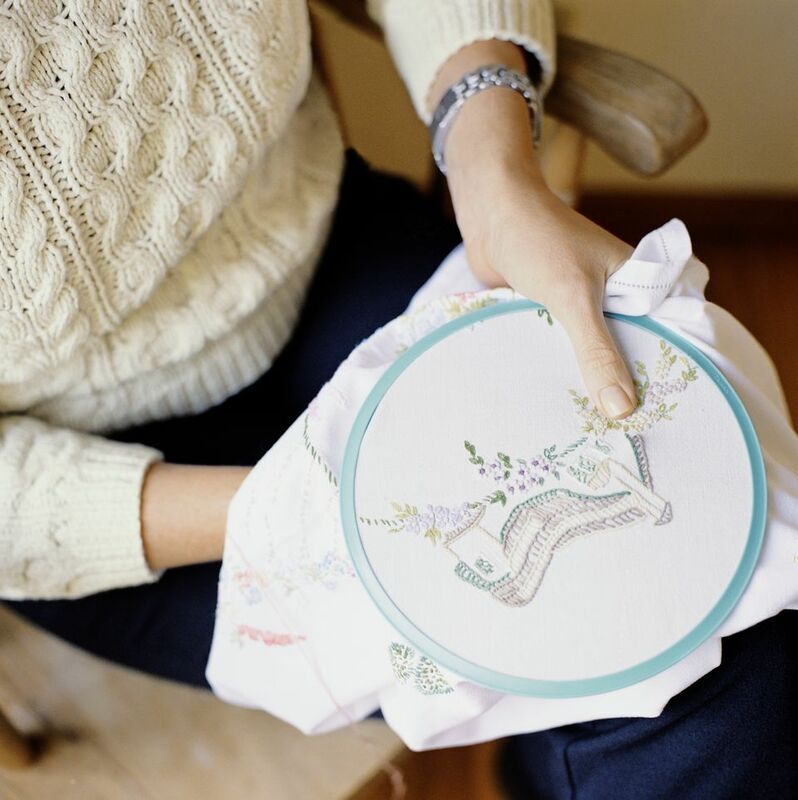 If you’ve ever wanted to try your hand at working a needlepoint project that looks like delicate embroidery on canvas, then the T-Stitch will help to create the light and airy texture you desire. Its open-weave quality helps to further accent the main motifs of a needlepoint design. For a more decorative look that lets the canvas peek through, consider working the T-Stitch in needlepoint designs with geometric shapes or abstract areas. Depending on the needlepoint thread used, the technique will not only highlight and emphasize the stitched part but the areas around it as well. Wherever you place the T-stitch, the canvas will show through. As a result, it is best to use this stitch on colored canvas, or where the canvas itself is an integral part of the overall design. When used effectively, you'll be pleasantly surprised at how beautiful the T-stitches will make the finished design look. Colored mono or interlock needlepoint canvas are the best choices when using this stitch. The T-stitch does not look as nice when worked on Penelope canvas, due to the double-threads that may spread apart when working multiple rows of T-stitches. Another terrific attribute of this stitch is that it is economical - you will use less thread to fill an area with this stitch than you would most other filling stitches. It also looks great worked in specialty threads with glitter or metallic accents. How to Work the T-Stitch in 10 Minutes or Less! The T-stitch is a diagonal needlepoint stitch similar to the continental tent stitch, with the exception that each row of stitching faces in the opposite direction. It can be worked over one and sometimes even two canvas mesh threads to create a diagonal "T," from which it gets its name. Odd-numbered rows are worked from right-to-left and even-numbered rows from left-to-right for a quick and easy decorative effect. Download the stitch diagram image above and follow these steps to learn how to make the T-Stitch in 10 minutes or less. Beginning in the upper right corner of the needlepoint design area, come up at (1) and cross right-diagonally over one intersection of canvas mesh threads to go down at (2). If you want the T-Stitch to be larger, cross over two mesh intersections. Skip one full intersection of vertical and horizontal mesh threads and come up at (3) as indicated on the stitch diagram. Work diagonally again to go down to the back of the canvas at (4). Continue working each stitch across the row to the boundary of the motif, making sure that all stitches slant to the right. Start a new row by working from left to right, coming up at (1) and crossing left-diagonally over one canvas mesh to go down at (2). Skip a mesh intersection to come up at (3) and work diagonally with a left slant to go down at (4). Work in this manner across the entire row. Continue making T-Stitches by alternating the direction of every row of stitches as indicated on the design chart. To see this stitch in use in a needlepoint project, take a look at the free Chunky Spring Bird pattern. The T-stitch was used as the background filling in the center square, but it could also have been used to fill in one of the bird’s tail feathers or as a substitute decorative stitch technique for other design elements as well.